The AMX-13 tank had been a great success for the French Army and the countries exported too. 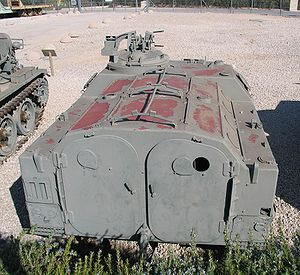 The APC variant to enter production in 1957 was designated the AMX-VCI. Its estimated around 3000 of The French AMX-VCI APC were manufactured by Creusot-Loire Industrie and Chalon sur Saone, which were later made part of GIAT Industry’s. The turret was replaced by a heightened superstructure to create the troop compartment. The driver is front left with the engine to his right. The commander and gunner (operates a 12.7mm MG) sit in the front of the superstructure and the ten man troop sit in the rear superstructure. They sit on benches, 5 man per bench back to back with firing ports to use their personnel firearms in. It has many optional equipment such as NBC system. Ambulance (VTT/TB) transports four seated or three stretcher patients. Command Post (VTT/PC) equipped with communications. Cargo (VTT/cargo) 3000kg carrying capacity. Anti-tank fitted with MILAN or TOW ATM’s. Fire-control vehicle (VTT/LT) Battery command for artillery units. RATAC radar carrier (VTT/RATAC) with RATAC battlefield surveillance radar on roof. 155mm Support Vehicle (VTT/VCA) operates with 155mm SPG with 155mm Mk3 F3 SPG and carries gun crew & ammunition. 81mm mortar carrier (VTT/PM) has 81mm in rear firing through roof. 120mm mortar carrier (VTT/PM) has 120mm in rear firing through roof. The AMX-VCI was replaced in service with the French forces with the AMX-10.